excellent wallpaper. it's the first one i've seen that has kenshin, kaoru, and kenji together. Pretty made!!! The colouring of the manga scan is done great! This wallpaper is very good-looking. 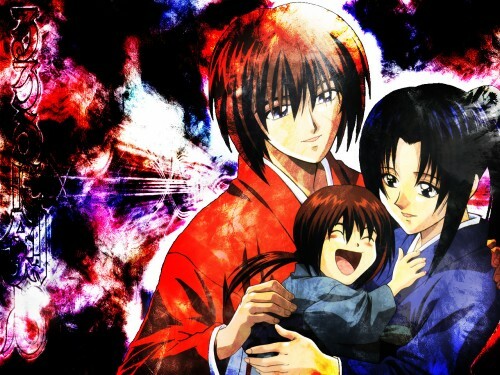 Is that Kaoru and Kenshin with a kid?? Or is that Kenshin as a kid?? ^_^ Anyway, I'm adding it to favs! Kenshin and kaoru have a child.But the ending is so sad. Anyway,I see the happiest family. I really really....... like this wallpaper. But.... the background is kind of too brasky.... the scan is cool tough! Wow, Kenshin looks so gentle... Well, I guess having a family and a place to stay can do that to you. Very nice work. Ahhh! I've been waiting for a good wallie of this picture. Nice job. The colors kind of hurt my eyes a little, but it's tough to pull off a red and blue blend. Aww!! That's so cute! Kenshin would make a first class father and kaoru a nice mother. Great wall! so nice~! such a warm family! Kawaii!!! I love the scene of their family... Amazing effects of the background... great job!!! This is fabulous. This is the first wallie I'm adding to my favorites. I love it! You are wonderful. Thanks for working so hard to get all the colors in line.